I'm a big fan of using images in briefs and opinions when that is appropriate, and it's hard to think of a more appropriate case than one involving a lady in a banana suit. The specific case I'm thinking of (in case there are more than one) is Conrad v. AM Community Credit Union, decided on April 14 by the U.S. Court of Appeals for the Seventh Circuit (Chicago Tribune; thanks, Tom). Those of you who know something about that circuit won't be too surprised to know the opinion was written by Judge Richard Posner, one of the nation's best legal writers and a man not afraid to stick a banana picture in a court document. 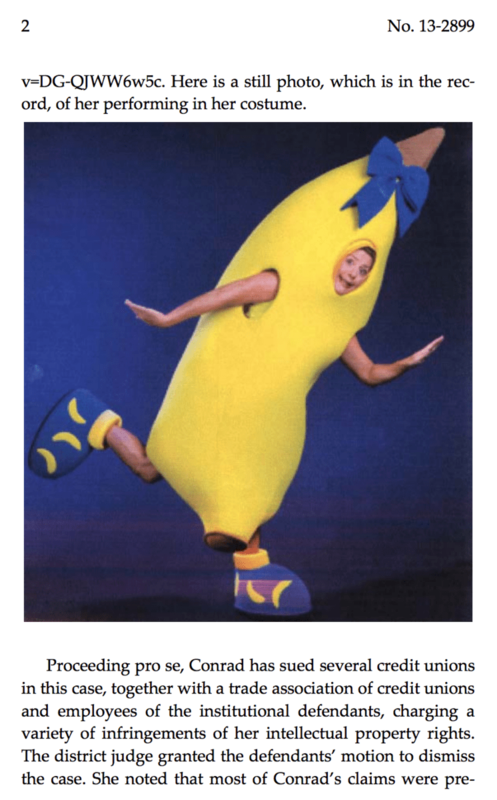 The case involved a "singing and dancing entertainer (also a writer and motivational speaker" who "calls herself the 'Banana Lady' and performs wearing a costume in the shape of a giant banana," Posner wrote. "You can watch her dancing the 'Banana Shake' on YouTube …"
… and "[h]ere is a still photo, which is in the record, of her performing in her costume" (see top right). The Banana Lady had sued some people who hired her to perform a singing telegram, according to the opinion. She claimed that members of the audience had posted photos or videos of her performance on the internet, something she claimed was a copyright violation. Posner disposed of that in a hurry. Performances cannot be copyrighted unless they are "fixed in any tangible medium of expression," he wrote, and Banana Lady did not record this one. The photos or videos could have been reproductions of copyrighted elements of the performance, or maybe derivative works (probably not). But even if they were, the court held, Banana Lady could not sue the arrangers because (as requested) they told the audience not to post images on the internet, and she did not sue any audience members. "So her suit has no merit," Posner wrote on page six. "But we cannot end this opinion," he continued, without noting Banana Lady's "abuse of the legal process by incessant filing of frivolous lawsuits." She has filed at least 17 mostly frivolous cases since 2009, including one against people who didn't post a video of a different performance. She had demanded $40,000 for that privilege, and they declined. She then argued that their decision not to pay her constituted "tortious interference with her business," an argument that did not prevail and caused me to check the "Brilliant Arguments" box for this post. The court ended its opinion by suggesting that the district court, which has been allowing her to file in forma pauperis (without paying a filing fee) should stop doing that at least until she pays prior litigation debts. That seems like a good idea. This is not, of course, my first post involving someone in a banana suit, although it has been a while. See "Police Stop Knife Fight Involving Banana Boy," Lowering the Bar (Jan. 2, 2006). In that case, though, I think the fruit-clad perp was wrongly accused.